Pass on the deeply-rooted Mardi Gras traditions to the younger generation at a family-oriented, safe and wholesome environment in Lake Charles, La. Children’s Day includes exhibitions of performing arts, technology and science, safety and health, and arts and crafts—all interactive and hands-on. The event coordinates with other public Mardi Gras events that day such as Taste de la Louisiane and the Children’s Parade, offering entertainment and culture to the public at the Lake Charles Civic Center. Typical activities for Children’s Day include an education station, making Mardi Gras arts and crafts while learning about the traditions and history of the carnival season and more. Children have the opportunity to be photographed in a costume display sponsored by the Mardi Gras Museum of Imperial Calcasieu and take home free souvenirs. 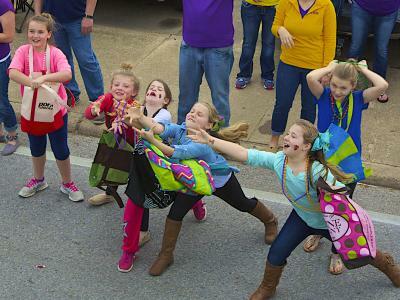 A purple, green and gold parade in Lake Charles for the young and young at heart. 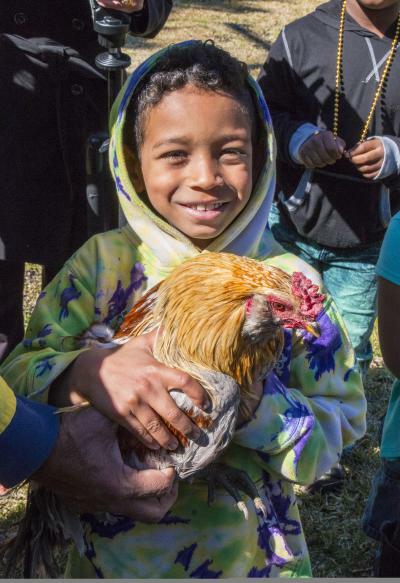 Catch a chicken at the Iowa Chicken Run! The parade goes west on Hwy 90 stopping at local businesses and continues going through neighborhoods with the horses following behind. The captain blows his whistle at participating homes for the crews to get down and dance to zydeco music, which is played with an accordion and scrub board. If the families approve the dancing skills, they donate ingredients to the gumbo, and a chicken is thrown into the air. Sometimes the captain will throw multiple chickens in the air several times or more for the children to catch. The Mardi Gras Museum of Imperial Calcasieu is really an amazing display for all ages to experience! It’s located in the Historic Central School. The spectacular exhibit fills five rooms in the east wing of the historic school with fantastically imaginative feathered, glittering costumes of past celebrations. Each rooms tells the tale of Mardi Gras in Southwest Louisiana from the early beginnings of Cajun Carnival celebrations, costume design, costumes of royalty, kids’ costumes, and a culminating parade float experience complete with our famous dog’s parade! A parade of costumed pets and their owners makes for a whimsical, carnival atmosphere. The title of "Mystical Dog" is given to the most strikingly costumed participant. One of the most highly attended parades during the Mardi Gras season, the day-time parade attracts pet-lovers and families. The Zone is an area located along the main parade route, in the empty parking lot between the Charleston Building and the Parish Courthouse on Ryan Street, that is completely alcohol and tobacco free. The event is kid-friendly and is filled with free fun activities, entertainment, and food. Click here for more kid-friendly ideas to enjoy. Download the 2018 Mardi Gras Event Brochure!